The Yellow Staircase Project is a student initiative with full administrative support. To free the Yellow Staircase of its yellowness'and replace it with colourful paintings and murals'students are being asked to submit proposals. The medium is paint but all students are welcome and encouraged to submit. Exhibit your work! Create community! Get exposed! Inspire change! Submissions are due by Friday, September 28 and after jurying, painting will begin in mid-October. The Workshop Gallery in Toronto presents new work by alumna Shelley Beach. three members of the OCAD community were named semi-finalists, their works selected from more than 1400 works submitted by 690 artists from across Canada. Anders Oinonen (Drawing & Painting, 2000) of Toronto and former faculty member Kim Dorland were chosen as semi-finalists representing Central Canada, while alumna Aleksandra Rdest of Pouch Cove, Newfoundland & Labrador (Drawing & Painting, 2002) was selected as an Eastern Canada semi-finalist. The competition, supported by the Canadian Art Foundation, will announce a national winner and two honourable mentions, selected from the semi-finalists, at the Ontario College of Art & Design. STRETCHED PAINTING explores contemporary works that push beyond the flat rectangular format to occupy space and new materials. Featuring Toronto artists that are expanding painting’s conventions, the exhibit brings new works that merge painting into the realm of sculpture and installation. Exhibit curated by Emily Harrison. Wallis Cheung makes paintings at the intersection of sculpture and collage. Her 3-dimensional work questions the limits of pictorial space, intervening physically with the room. Cheung is a member of the Toronto-based collective, VSVSVS, and is nominated for the 2016 RBC Canadian Painting Competition. Michelle Foran transforms found objects, such as industrial steel, plastics and piping, into materials with vibrant colour, texture and painterly composition. Her abstract immersive environment, “Half a Grapefruit is a Full Circle,” was recently displayed at Birch Contemporary. Heavily influenced by her surroundings, Emily Harrison’s practice examines everyday materiality, consumer culture and tropes of the artist studio. Her humorous, site-specific installations have been apart of festivals with the Bata Shoe Museum, Strangewaves and Camp Wavelength. Deep in the OCAD University Archives is a paint box that was used by Lois Parker from 1932 to 1935 at the outdoor summer school held in Port Hope, Ontario. 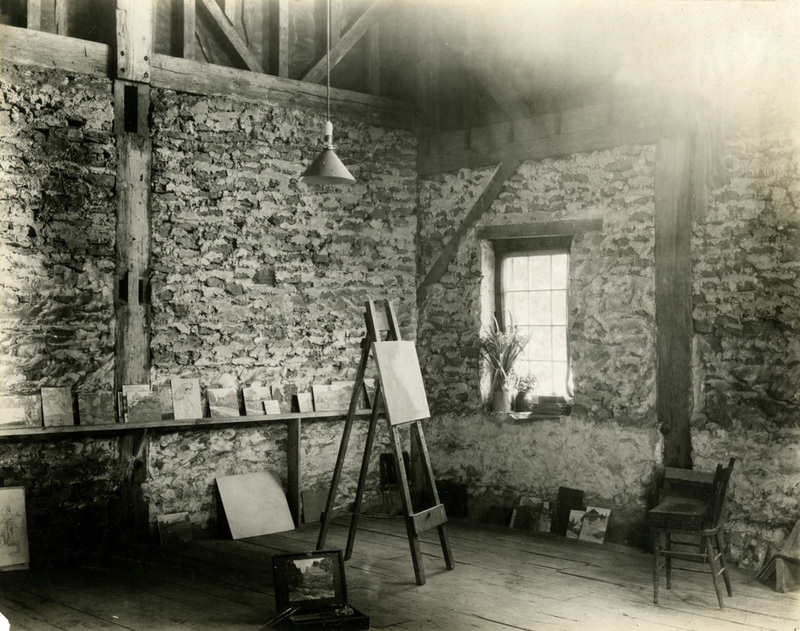 The Ontario College of Art (OCA) — as OCAD U was then known — began hosting the summer school in a converted grist mill on the banks of the Ganarasca River in 1923 (the school actually began in 1913, taking place in various locations before settling in Port Hope). The location provided ideal scenery for landscape drawing and painting, as well as for outdoor figure study. 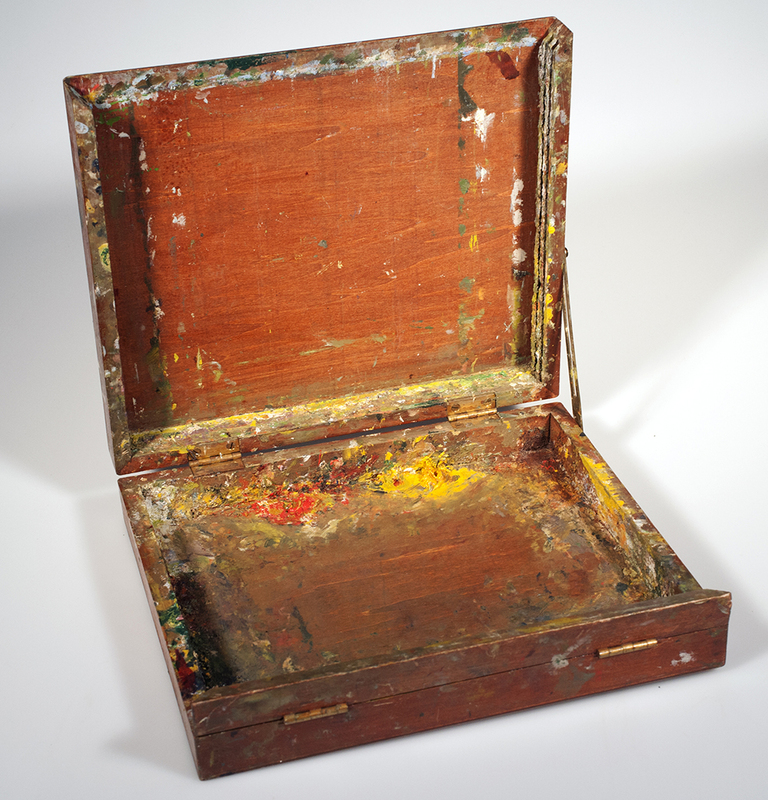 The paint box is a fascinating record of Parker’s time at OCA’s summer school. It served as container, palette and easel. Inside, there are suggestive remnants of Parker’s work, such as globs of coagulated paint and two landscape sketches (not pictured here) supported by grooves in the box’s lid. The exterior is covered in signatures of classmates and instructors, with J.W. Beatty’s signature at the bottom right. J.W. Beatty — celebrated Canadian landscape painter and World War One artist — founded and ran the summer school, and was its greatest single influence. Parker did not provide a written account of her time at the Port Hope summer school, but a typical day can be pieced together from student stories, newspaper articles and other material in OCAD U’s Archives. The first thing on each morning’s agenda was usually a critique of the previous day’s work in the studio. 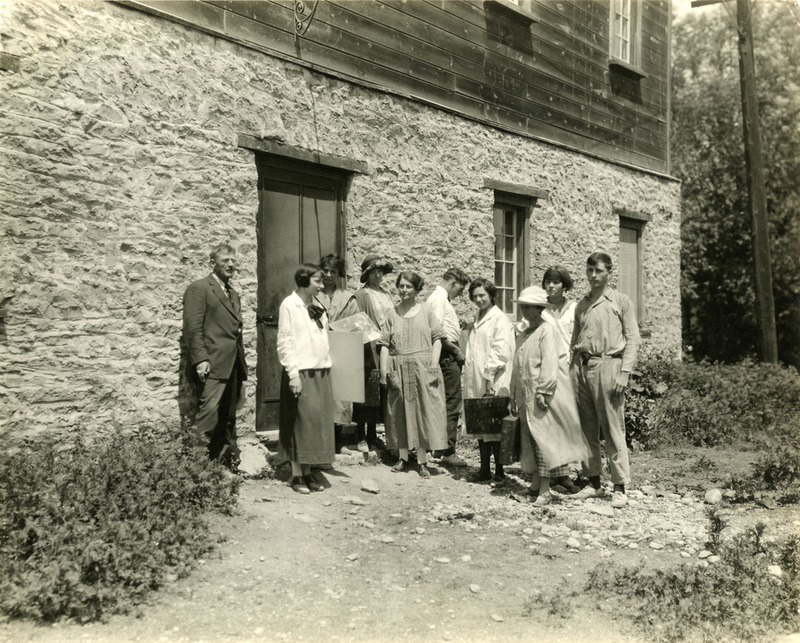 Afterwards, Beatty and the students would venture out in search of a new subject, such as the cedar grove, Archer’s farm, the mill pond, the Port Hope waterfront or a horse. On Friday and Saturday evenings, students held parties in the studio or visited the Cobourg dance pavilion to mingle with the locals. 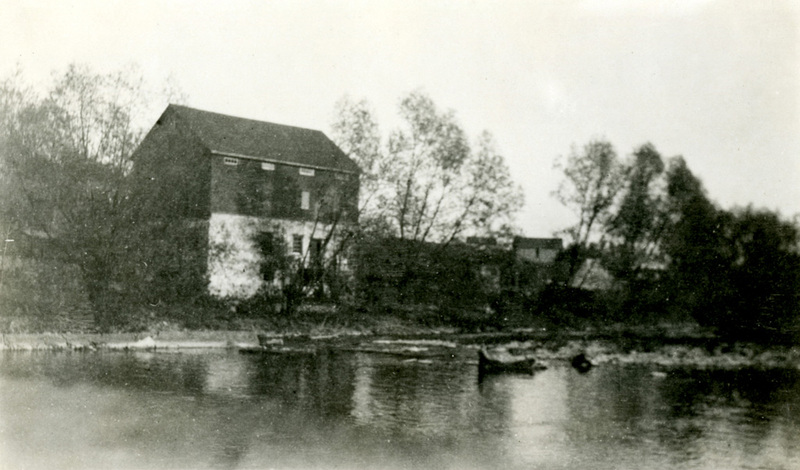 After tranquil days and intoxicating evenings, students would return to their living quarters — women in the loft above the studio and men in a large tent outside. Then, the next morning, the fogginess of the previous evening could be washed away with a brisk swim so that the routine could begin again. Unfortunately, OCA’s outdoor summer school regularly operated at a loss. Facing a tough economic situation in Toronto and a decrease in attendance, the school closed in 1935. Although the summer school was not financially sustainable, the impact it had on the students who attended is undeniable. Like a highly personalized yearbook, Parker collected signatures on her paint box in order to remember her time in Port Hope. 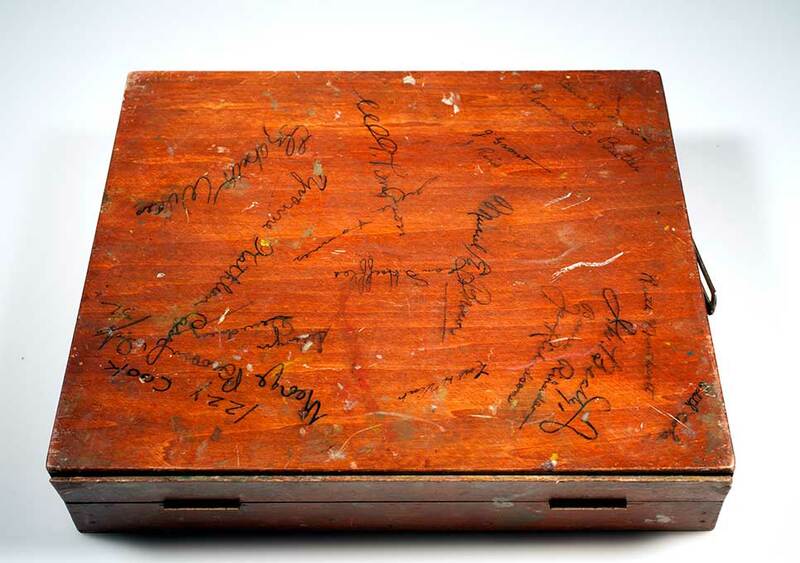 She preserved the box for over 50 years, before donating it to the OCAD U Archives. This unique souvenir now helps to paint a picture of this romantic time in the university’s history. Dack, W.L., “Port Hope Revisited: Memories of a Gentler Age.” Alumnus (winter 1982/83): 5–6. Principal’s Annual Report, 1922/23. OCAD University Archives, OCAD University fonds. RG8 Governance and Administration. Council/Board of Governors Meetings & Minutes. 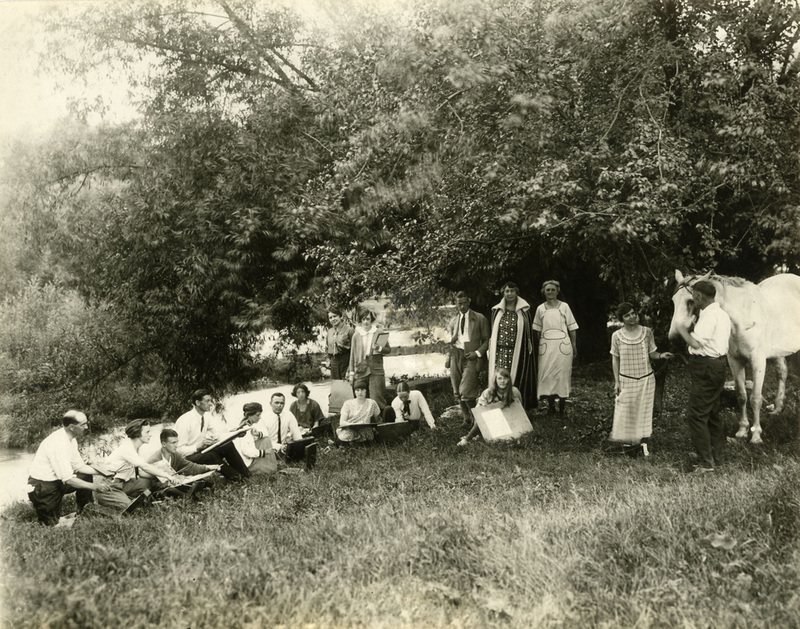 Special Report re: Summer School, 1924. OCAD University Archives. OCAD University fonds. RG8 Governance and Administration. Council/Board of Governors Meetings & Minutes. Minutes of a Meeting of the Council of the Ontario College of Art, Held at the College on Friday, February 28th, 1942, at 6:00 p.m. OCAD University Archives. OCAD University fonds. RG8 Governance and Administration. Council/Board of Governors Meetings & Minutes. Scott Hillis, MI, is the visual resources coordinator and acting archivist in Visual Resources & Special Collections at OCAD University’s Dorothy H. Hoover Library. You are invited to meet painter, curator and writer Robert Houle, 2015 winner of the Governor General’s Award in Visual and Media Arts. Houle is a member of the Saulteaux First Nation and taught at OCAD U for more than 15 years. His recent works include an installation in the AGO’s Walker Court entitled Seven Grandfathers. Artist Reception: Saturday, April 23, 2 to 4 p.m. The exhibition's 24-page colour catalogue features an introduction by OCAD U associate professor David McIntosh. April 2 to 30 -- Gallery Gevik will be exhibiting a new body of work by Stuart Reid during the month of April. This series, entitled ‘Beliefs’ are ‘glass canvases,’ and can be viewed as front-lit paintings or as backlit-illuminated images. Last summer, Reid’s world-class art installation ‘zones of immersion’, debuted at Union Station. This installation consists of a 150-metre screen of glass panels with multi-layered mural images, poetic writings and rich primary colors with black and white drawings.